We offer complimentary standard delivery within Australia for all orders AU$250 and over. - The price of the product/s must meet the required amount ($250 AUD) in order to receive complimentary shipping. Shipping cost does not count towards your total to qualify. - Standard delivery service only, refer to Standard Delivery within Australia in Delivery Policy for more details. 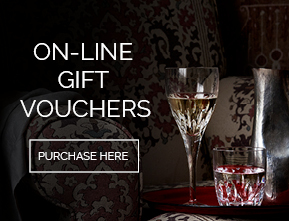 - Complimentary shipping is only available for orders placed on waterfordcrystal.com.au for delivery to an Australian address. Personalised Orders - Express delivery is not available for personalised/engraved orders as they require 7 additional business days of production time prior to shipment. Personalised/engraved products will be shipped with non-engraved products in the same order. Please ensure you enter the correct delivery address as parcels that are returned to us as undeliverable will incur a re-despatch fee. Subject to our Returns Policy, freight charges paid for the original despatch are not refundable. Refer to the information below on delivery times and conditions for each delivery option. 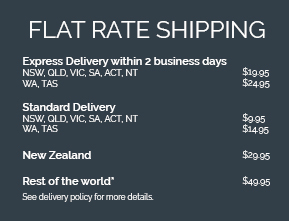 Delivery to PO Boxes is only available to Australian deliveries. We use Australia Post for all standard deliveries within Australia. Australia Post delivers during normal business hours. If you are not at home when the goods are delivered, Australia Post will leave a card informing you of how to collect your goods at a specified location during normal business hours or to arrange a suitable re-delivery time. If at Checkout you give "Authority to Leave" your parcel if not home, a signature is not required on delivery and your package will be left at a suitable place at your delivery address. If the Australia Post contract driver cannot identify a suitable place to leave your package and deems the goods will not be secure if left, your package will be delivered to the post office for collection and a card will be left. If products are in stock they will normally be despatched within 3 working days of accepting your order and after despatch should arrive within 2 – 10 business days depending on your location, longer for International orders. *Delivery Times are estimates only and are based on assuming regular business operations, excluding weekends, holidays and unexpected warehouse closures. Delivery estimates are in no way a guaranteed delivery date. Once orders are picked up by Australia Post, we are not responsible for delays caused by unforeseen circumstances with the delivery carrier, incorrect/undeliverable shipping addresses, weather and other natural causes, or other factors outside our control. Delivery is available to metropolitan areas only. Delivery to PO Boxes or Parcel Lockers is NOT available for express services. Express Delivery within 2 Business days, parcels are only delivered Monday to Friday between 9am to 5pm excluding any public holidays. Customers in areas who qualify for Express Delivery will be able to select this option at Checkout. We use StarTrack Express for all express deliveries, if you are not at home when the goods are delivered, the driver will leave a card informing you of how to collect your goods at a specified location during normal business hours or to arrange a suitable re-delivery time. If at Checkout you give "Authority to Leave" your parcel if not home, a signature is not required on delivery and your package will be left at a suitable place at your delivery address. If the driver cannot identify a suitable place to leave your package and deems the goods will not be secure if left, your package will be delivered to the post office for collection and a card will be left. We cannot deliver to PO Boxes outside Australia, therefore a residential or business address is required. Delivery is provided by DHL or DSV couriers. If you are not at home when the goods are delivered, our couriers will leave a card. International orders may be subject to local tax, charges and customs duties. Any such costs and associated fees, if applicable, will be charged once the goods reach its destination country. These charges must be paid by the recipient of the goods. We have no control over these charges and cannot predict what they will be. We cannot be held responsible for any additional charges on your order, nor can we accept a return of the order in this case. Customs policies vary widely from country to country, so please contact your local customs office for further information. The product prices quoted on our website are in Australian dollars the same for both Australian and overseas customers. We do not adjust the prices for GST and you are responsible for any local tax, charges or custom duties.